The long-awaited BMWi line is starting production next year with the i3. The top of the line i8 is expected to launch in 2014. Today BMW has released two new concepts, the i3 and i8. Both cars are heavy on the technology and feature gasoline-electric engines. These two futuristic cars are getting ready for production and are scheduled to appear at this year&apos;s run of auto shows. BMW&apos;s new eco-focused lineup will include everything from electric cars to plug-ins to scooters. Given the i designation, the first off the line will be the i3 aka Megacity Vehicle. 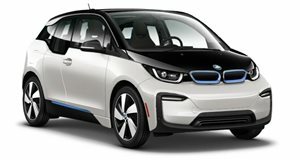 The i3 has a lightweight body structure that consists of aluminum and carbon fiber-reinforced plastics. The i3&apos;s Drive system integrates the suspension, liquid-cooled lithium-ion battery pack and electric motor into a phenomenal rear-wheel-drive EV hatchback. The motor puts out 170hp and 184lb-ft of torque through a one-speed transmission. The i3 can hit a top speed of 93mph and goes from 0-60mph in just under eight seconds. The top of the i line i8 plug-in hybrid hasn&apos;t necessarily been hiding as of late. We have seen the Vision EfficientDynamics Concept in 2009 and it has been spotted performing some cold weather testing around the Arctic Circle. It was also spotted on the set of Mission Impossible 4. The i8&apos;s LifeDrive architecture involves both passenger seating and its propulsion system based on the cutting of any excess weight. The lightweight car is also made with a carbon-fiber-reinforced plastic monocoque that offsets its heavy electric drive components keeping the total weight under a respectable 3,300lbs. 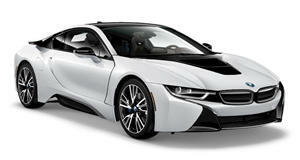 The i8 will run a 1.5-liter turbocharged three-cylinder engine that puts out 220hp and 221lb-ft of torque. The BMW hits a top speed of 155mph and gets off the line from 0 to 60 mph in less than five seconds. BMW also claims the i8 will return 78mpg on the European cycle. Both the i3 and i8 feature PRO ECO mode, which allows the driver to take the most energy efficient way towards his or her destination. The smart drive makes use of braking, acceleration, electronics, etc. to use the lowest amount of energy possible. The i8 is scheduled to debut at the 2011 Frankfurt Auto Show in September. The production version is confirmed for launch in early 2014. The i3 is expected to launch next year.